Dropped, used for drinking virtual pints, identifying music in clubs and for finding a curry house – just what Steve Jobs imagined. Possibly. 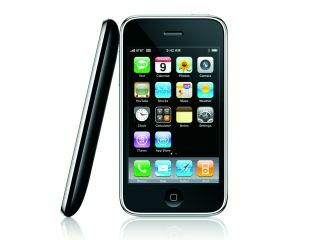 Has Apple's iPhone 3G lived up to our expectations? It's been just over a week since we first got our hands on the second gen iPhone (though not everybody's been so lucky). As we said in our official review of the device last week, it isn't a major sea-change, nor will it seem a whole lot different to those with a first-generation iPhone. Crucially though, to new purchasers the iPhone will seem an awesome device, with an unrivalled user experience. So with the benefit that only an elongated week-in-the-pocket test period can provide, let's look at the best and worst bits of both the hardware and Apple's iPhone 2.0 firmware (which has locked on us a couple of times). And yes, we have dropped it, but it was in a case and bounced off the floor of the train. And no, we're not dropping it properly – you need YouTube for that kind of reportage. Firstly, let's look at battery life. True, the first charge we gave it ran out remarkably quickly, but that was mainly because we were running amok downloading various apps and showing everybody that wanted to have a peek at the new device. Wired.com thinks the iPhone's battery life "drains juice faster than a toddler in the desert" though we don't completely agree – if you're used to an older Nokia N95 or first-gen iPhone you won't find it out-of-the-park thirsty. We believe with non-excessive data/GPS/Wi-Fi use you'll be looking at recharging every 2 days. And by the way, recharging is pretty speedy, so you can give the handset a reasonable amount of juice in, say, 30 minutes. However, if you're using the new iPhone for Exchange email and internet on business for several hours of the day, you'll be needing your charger alongside your lunch box. One thing Wired also picked up on which we didn't mention in our review is voice dialling – again absent and making use while driving a very big no-no. Talking of talking, since the iPhone 3G is such a good device for internet and email, it's easy to forget that the phone function itself takes a bit of getting used to. Thankfully though, Apple's addition of a new Contacts app means getting to your numbers to actually call them is much, much easier with the 2.0 firmware. We've also come round a little to texting. While we'd still really like Apple to add a numerical keypad to the texting app for thumb-use, the keyboard is fine to use – unless, that is, you're in a car (as a passenger, obviously). Want to text someone when en route? Stop at the next Moto. Our iPhone 3G has some difficulty locating 3G networks from time to time, but we wouldn't go so far as to say that O2's coverage is patchy. In fact, data access is now lightning quick, and while it doesn't have HSDPA level-access, you won't be downloading huge amounts of data like you would possibly be with a laptop. There have been a few reports lauding the iPhone 3G as an excellent GPS advice. It isn't. We tried to get to a meeting with it in Central London the other day and it didn't keep up with our position very effectively, though we did find our curry house over the weekend. It also locked on us once ending in a reset, while it's not always obvious when a GPS lock has been obtained. Yes, a blue blob appears to pinpoint your position, but the whole user experience is a bit like taking a pee in a pitch-black bathroom.